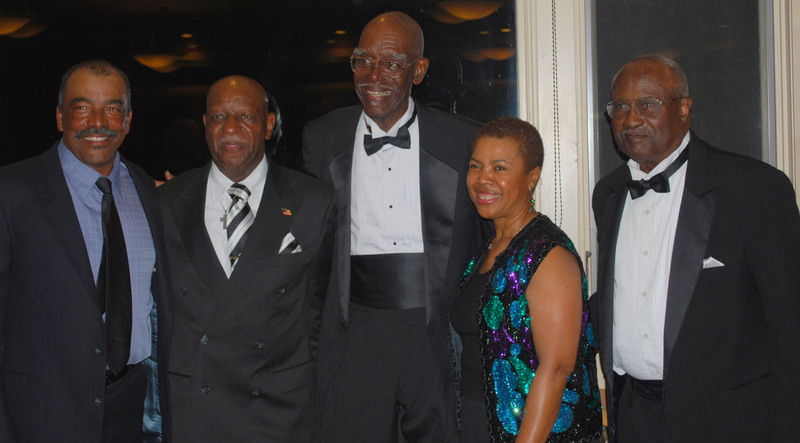 In honor of Black History Month, Sistas On The Links (SOTL) hosted a gala honoring Bay Area Black Legends of Golf. The event held on February 11, 2012 aimed to honor African-American golfers who have taught, inspired and influenced many others over years and generations. Janet Johnson, President of SOTL dreamed-up the idea of honoring these truly great icons. When she brought the idea back to the club, the membership agreed that not only was it a great idea but that it was also a great way to acknowledge Black History month. SOTL member Vanessa Donaville volunteered to Chair the Gala Committee and the results were phenomenal. 140 people gathered at Sequoyah Country Club in Oakland for the semi-formal affair. With Valerie Coleman-Morris, Emmy award winning journalist and former CNN domestic and international business anchor serving as mistress of ceremonies, the event kicked-off with a formal dinner and was followed by presentations to each of the honorees; Leonard “Googie” Kirtly Jr., Tommy “Coach” Scales, Willie Simmons Jr., Winslow “Woody” Woodard and SOTL’s own Lynda Donahue who was honored as the 1st SOTL Most Inspirational Golfer of the Year. The honorees all have a passion for golf and a passion for teaching the game. Each of them believes that golf is more than just a sport. It’s a game that teaches integrity and patience. All of the honorees have worked with youth groups as well as adults. SOTL President Janet Johnson and Vice-President Stephanie Fleming presented the awards and each honoree received a well-deserved round of applause and standing ovation. The evening closed with several of the legends on the dance floor with the Sistas showing SOTL that they can do more than play golf. Googie is known as “Mr. Golf” in Oakland. Every year he hosts the “Googie and Friends” golf tournament fundraiser with proceeds going to 5 local organizations that provide opportunities for youth to enhance their academic and leadership skills as well as build self-esteem and promote integrity while learning the game of golf. Googie who turns 88 this year says he has much more to give to the community he loves and to the youth of Alameda County. Woody has been a professional golfer since 1973. After much success he realized his true passion was for teaching the game. He relocated to the San Francisco Bay Area in 1978 and began working at what is now Metropolitan Golf Links where he sharpened his administrative skills and expanded his interest in teaching. By 1981 he notoriety in the Bay Area golfing community grew and he became a full-time instructor at Chuck Corrica Golf Complex in Alameda. As a result he has helped shape to lives aspiring enthusiasts. He prides himself with the results of teaching beginners, intermediate players and active professionals. Coach Scales is well known as a youth golf coach in the Bay Area. He not only teaches the principles of golf but he puts education first and offers spiritual guidance. He is the director of the Lake Chabot Jr. Golf Academy and coaches the Ace Kids Golf Program for the Oakland Park and Recreation Department and the Berkeley High School’s Boys Varsity Golf Team. He has also coached at Piedmont and Holy Names’ high schools in Oakland. Coach has a passion for work with young people. He somehow also has found time to coach many adults along the way. Willie Lee Simmons Jr. is an icon in the Sacramento golfing community and is instantly recognized by his signature leather hat. Mr. Simmons is a staunch support of promoting education through experiences in the game of golf. In 1990 he founded a non-profit organization whose mission is to enrich the lives of minority and underprivileged youth by exposing them to positive social experiences and character development, and inspiration values through golf. Mr. Simmons is also a charter member of the African American Golfer’s Digest and serves on their editorial board. Lynda Donahue is an avid golfer and one of the founding members of Sistas On the Links. Her husband introduced her to the game 18 years ago and the passion immediately ignited. In 1998 she joined the Rancho Solano Women’s Golf Club and made her true skills known. She is a seven-time champion for that club. She has played and won top prizes in numerous other national tournaments including being a three-time women’s winner at the Black Enterprise Annual Golf Challenge. As a charter member of SOTL, one of Lynda’s goals is to support and increase golf participation among African American women and juniors. She is truly an inspiration to the club.